There are many women out there, who believe that life comes to a halt with old age. The life becomes boring with nothing to do and even, many stops caring about themselves. Therefore, this article is for those women who have lost somewhere the spice of their life. 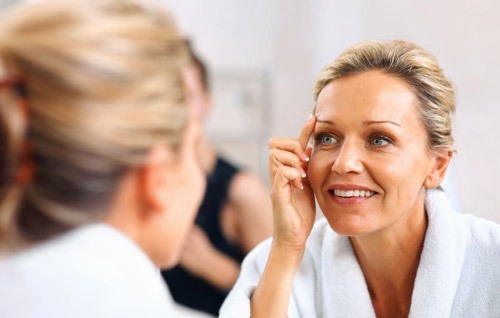 Life at 50 means, it is the right time to pamper yourself and fight against the aging process. This is the time to celebrate womanhood. It has been said that with growing age, the elegance and grace of the woman increases. So why not try to increase her beauty too. So here, I am sharing 9 simple steps, which can be followed to look and feel better at this age. This is the time when you are loaded with responsibilities like taking care of your home, looking after your hubby, baby-sitting your grandchildren, etc. In midst of these, many women forget to take care of one’s self. Therefore, it is necessary to sleep well. This will make you look fresh and energetic. Retinol treatments will help to reduce those wrinkle lines around your eyes and your plump skin. So go to the shop, ask for the products with Retinol, and start treating yourself. You can even ask for the same from a dermatologist. With age come wrinkles. Now this wrinkles pop up near your eyes and eyelids. By applying mascara, your eyes will look brighter, hiding all those wrinkle lines. It is recommended to use fewer amounts of foundation and concealer on the face, as they have a negative effect on the skin. You may look more aged with these products. Therefore, it is better to start using moisturizer and other light base products. Feel free to use money saving coupons from Dealslands UK to get attractive discount so that you don't hesitate while buying. You can even use a small amount of concealer to hide the dark spots. In case you are using a foundation, make sure you use the hypoallergenic versions, as you will have sensitive skin now. There are women who love to have tanned body, as it gives out an even skin tone. At this age, it is better to avoid going in direct sunlight, as the harmful UV rays may badly affect your skin. You can better opt for spray options, as they can be safe to use. Go to a spa for a good spa treatment or get a facial or a pedicure and manicure done. In short, spend some time for yourself. In case you are getting ready for any function, you can really take the help of a professional person. In case you love to have a haircut, then just do that, as that will give you the feeling of best. There is no harm is spending a little on things that will make you happy. Many a times, we have the habit to look in our photos, and start comparing ourselves with our past looks. This is wrong. You must understand that you are not young anymore and you have lived a full-fledged life now. So accept your present looks and embrace yourself. Whenever you go out, try out some new dress, that you have always thought about to wear. Give importance to your choices and your own way. Don’t think too much whether people will like that or not. Just remember one thing that old age is an inevitable part of our life. When we get older, it is natural to get grey hair and wrinkled skin. So instead of feeling bad about our looks, feel graceful and accept the beauty of nature.